I have lots of caterpillars on my Passion Vine but this is the first time I've found a Fritillary Chrysalis...I moved it to my screen porch after I took this picture. 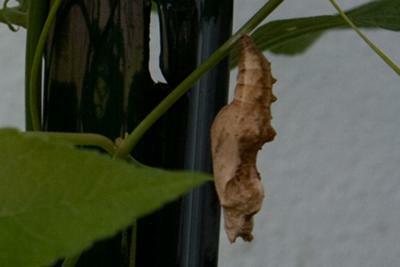 Thanks so much for the photo of the Fritillary chrysalis! It's a great addition to my website. Karen thanks for posting my photo...I love your site & all the great information....& butterflies!